Rivington Park Care Home, Chorley had an action packed festive season throughout December 2017. The season kicked off with a trip to Fleetwood Market with four residents who were ready to pick out their Christmas treats for their loved ones, they enjoyed a tipple of mulled wine whilst on their travels to keep them warm! Later in the month, residents enjoyed the Christmas party where they tucked in to a sumptuous buffet delivered by the homes experienced Chef team, whilst they eagerly awaited the arrival of their relatives ready to enjoy the day with family and friends. We had a visit from the carol singers from St Peter’s C of E Church and a much anticipated visit from St Peter’s school children to sing Christmas songs in the morning. Christmas Day was celebrated with a beautiful lunch for our residents, who all sat round the table together, some accompanied by their loved ones, and there was a real family feeling with the staff all joining in the Christmas spirit. On 31st December we had a firework display to see in the New Year, which was attended by residents and family members, followed by refreshments. New Year’s Day was a lovely occasion, with several relatives taking up the offer of lunch with their loved ones. A delicious Roast Beef dinner was much appreciated by everyone and very favourably remarked upon by all who came in to join us. We hope that this will become an annual event. Of course, we held our annual Christmas Raffle, with the top prize being an impressive hamper which was won by the family of one of our residents. Overall the home managed to raise a magnificent one hundred pounds for our Residents’ Fund. 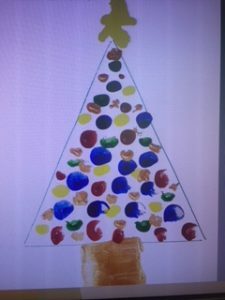 A resident at Rivington Park was a runner up in the Venturi Health Care Christmas card competition for 2017, he used his finger prints to design a lovely card. As runner up, Venturi Health Care got a number of his cards printed for him so he could use them to send to his loved ones.